Much as we might like it to be so, the unholy alliance of which Fr. Constantine writes is far from dead. 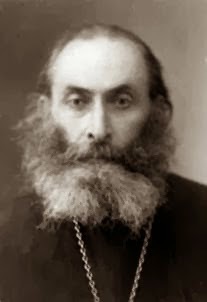 From its "modern" inception in the fateful events of 1927 when "Orthodox Russia split; one part became 'legalized' ... (and) the other part, the True Church, necessarily drank to the bottom the cup of martyrdom", this dreadful deception prepares for us a "terrible temptation ... from Satan who arrays himself in the image of an angel of light.... Only unweakened longing for the Heavenly Homeland can assure us firmness... brought about by maintaining faithfulness to the Church...."
Item# 2015. (DC: X) (22 pages) Saddle-stitched. $2.50. The year 1927 was the fateful date. Orthodox Russia split. One part became "legalized": it exchanged its martyric endurance of the Soviet yoke for a compliant "legal" recognition of illegal Soviet authority, giving away the Church not just to control by the Soviet satanocracy, but placing it wholly beneath its dominion. Consequently, the other part, the True Church, necessarily drank to the bottom the cup of martyrdom, forced for the sake of its very existence to withdraw into the catacombs. But all this satanic maneuvering did not free the "legalized" Church from extreme miseries and sorrows. Terrible destruction and extermination visited te external Church – but could this be "lawful" martyrdom? Only by the mercy of God could it serve for the personal salvation of some of the repentance sufferers. The conditions of the Second World War radically changed matters, bringing about sympathetic attention on the part of theBolsheviks towards the remnants of the church. There began a relative flowering of the Church under the watchful eye of Soviet satanocracy. From that moment, the so-called soviet Church began to appear with ever-increasing distinctiveness in two evil-conveying forms. Inwardly, there was a progressive "sovietization" of the clergy, which more and ore transformed that sole true thing left to the Church – that is to say, the Church services and the Mysteries, limited by the space of the church building itself – into something inauthentic, artificial and falsified. Outwardly, on the other hand, the Church made its appearance with an utterly false countenance, carrying out a most responsible Soviet assignment, upon the course of which the fate of the entire universe depends. The Soviet Church was compelled to lay paths of good will and voluntary association between the Red Kremlin and all the churches of the free world and through this with the whole free social world. Although in its internal life the Soviet Church is only becoming and anti-Church through a certain process that manifests itself as something we knowingly accept as something complex, externally the soviet Church does not appear at all ambiguous. In its universe-organizing, in its universally maneuvering satanic assignment, it is an anti-Church: unambiguously and absolutely. Reprinted from Orthodox Life, #64 (July/August 1960). While after an additional 40 years of experience with ecumenism and religious trends in the West, it might not be possible to be as sanguine as Archimandrite Constantine sometimes here is, his incisive analysis of the relationship between various factors in the spiritual climate of the world is as appropriate today as when it was written. Lost & Found? or USB Drop Attack?